Personal Sharing on Life, Education and Anything. "Every little smile can touch somebody's heart. may you find hundreds of reasons to smile today and may you be the reason for someone else to smile always. Happy New Year 2009"
"Ushering into 2009 marks another friendship and many shared moments. Cheers to amny great years ahead. Happy New Year." "May the new year ahead be a most fulfilling one filled with new beautiful memories, youthful struggles and moving victories!" "Every sunset gives us one day lesser to live but every sunrise gives us one day more to hope. So always hope for the best! 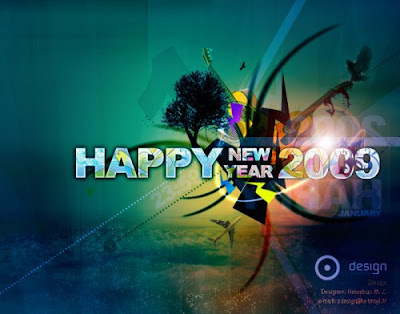 Have a fabulous and joyous new 2009"
"The year has gone but made us strong. The path was long, but we walked with a song. There were fearsw and tears, but we also had reasons for cheers. 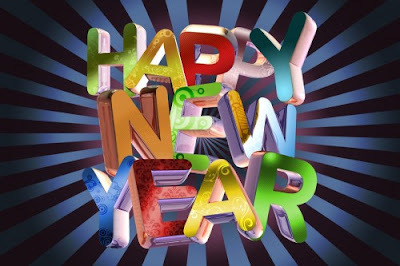 Wishing you happy memories of the year 2008 and have a great happening for the year 2009!" More 2009 Wallpapers can be viewed from Vu Nguyen's and Aronil's blogs. Just came back from the polling station which turn out to be my primary school, a place where I have not been visiting for the past 20+ years. Didn't stay long to reflect the sweet memories as my main purpose is to cast my vote. The process was fast as not many people were exercising their casting. I guess its still early then (11.00am....still early ah?) My mum woke me up to accompany her to vote at 9am. That's called EARLY. Anyway, my dad did accompany her and I did my voting later at 11am. Who did I vote? Just wait for the results to be announced tonight. 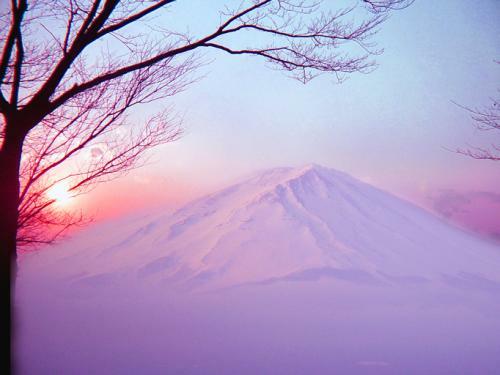 And whatever the results will be, PEACE is what I wish to have. Guess what? After the CNY was over, I just realised that I did not play a game of either mahjong or any kind of card game. The only mahjong game I played was with my computer. May be part of the reason was unable to find suitable mahjong 'kaki', timing for the session and early start work. But it is a good thing since I do not have to lose my angpow money. Hehe. How about you? Winning a lot or at the losing end? Addiction to gambling is not good. There are all sort of gambling tools which include the betting game too. Of course the football betting is another addiction to many but not to me. Although sometime my mum would ask me whether I'm actually bet on the soccer game since she realised that I like to watch soccer match live through the TV during the weekend. Watching and betting is two different thing. I like to watch my favourite team playing soccer but I don't like to bet. Again, do not addicted to gambling. Malaysian parliment was dissolved on the 13th Feb, the 7th day of the Chinese New Year and coming this Sunday 24th Feb, it will be the day for candidates nomination. Each day newspapers without fail are fully covered by the election-related news. These few days has been intense with potential candidates jostling for seats plus a few sensational news like DAP's Fong Po Kuan declining to contest in the general election due to the internal bickering. As for me, this will be my 2nd time going for polling. I had my 1st polling experience in 2004. I still remembered on that day, i went to the polling center which is just a 5 minute walk from my house together with my parent and sister. Of course, just before the entrance, various parties workers were there trying to get your support to vote for their respective candidates. The whole polling process just took a few minutes and after that, we walked home together to have our lunch. I guess this year will be the same. Happy election! After the bloody Virginia Tech gun shoot incident, another fatal gun shooting case happened at Northern Illinios University resulting 6 persons dead. This is also the fourth shooting case in US schools within this week. I think the US government really need to seriously consider the total firearm bans in the country to avoid such incidents to happen in the future. 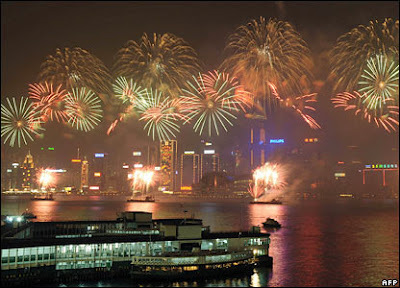 Firework light up the Victoria Harbour in Hong Kong to celebrate the Year of Rat 2008! most importantly MINNIE MOUSE bring you ultimate beauty and pleasure. May Year of RAT brings you lots of laughter, love and optimism. There will be another few more hours before the CNY 2008 starts. Today is an off day declared by the management. Taking advantage of being an off day today, I went to the Tesco with my mum to do some last minute CNY groceries shopping buying some canned drinks and mandarin orange. Well, the last day at Tesco offers mandarin orange at the price of RM4.88 and RM5.88 a box. Such as bargain. In the afternoon, I washed my car and changed the road tax sticker. Then when my brother and nephews came, we start our reunion dinner, a pre-event before CNY. Very full now. Waiting for CNY and the continuous loud firecrackers sound to come. Happy Chinese New Year 2008. Gong Xi Fatt Chai! Gong Xi Gong Xi! What I did in 2006? Click here. The management announced that Wednesday is a public holiday. Another day off! Our Prime Minister announced that Thaipusam is now a public holiday for KL and Putrajaya. Beside, there are also a few states celebrating this holiday such as Selangor and Perak. Waiting for the official announcement from the management on whether this Wednesday will a public holiday or not. Its the 2nd day of week 2 now. Had my MBA lecture at the PJ campus yesterday night. It turned out to be an interesting class with a mixture of fresh graduates and working adults. Basically it was a session of self introduction, course introduction, some basic IT terms and why business manager need to learn about IT. It going to be a busy week as few appointments has been arranged with students on their research consultation as their presentations will be held soon. Here come the new semester! Eager to meet up with my students again! Just came back from a longer weekend as compare to last year. Why? Because starting from this year onwards, my university is implementing a 5-days work system instead of 5 1/2 days for the past 5 years. A longer weekend mean more time can be spent with family and friends. The campus' lifts are back to the normal jam-packed during the peak hours in between classes. One's must choose the right timing to use the lifts in order to avoid being packed inside it or waiting for a longer time to enter the lift at the lowerground or ground floors. Watched Luton and Liverpool's FA cup match on Sunday. Another draw for Liverpool which seems the team is lacking of some confidence at the moment after a series of draws and defeat. The team started off very well but seems like losing some steams nowadays. Hope to see a revitalised performance by the team soon. Start of a new school year! Today mark the start of new school term for most of the states in Malaysia. The best part of it is all students will be able to get free textbooks provided by our Malaysian government. My university's new semester will only start next week where I'm looking forward to meeting my previous groups of students again. By the way, there is an interesting post on the implementation of e-discipline by 13 secondary school in Bentong. You can read it here. Wishing all of you a HAPPY NEW YEAR for 2008! More consistent blogging for this blog, hehe. Time flies and its another year. Normally I will compose a short poem to commemorate this day as well as to motivate oneself with a clear objective for another year. Creating unlimited glorious triumphs each moment! Again, you will find that the theme of the poem lies with being Youthful & Advancement. Received lots of SMS wishes, Friendster's comments and messages, MSN messages plus phone calls wishes. Thanks a lots to all my friends. Wishing all of you a happy and nice day too. In addition to a colleague who share the same birthday with me (he used to sit beside me for almost 2 years), today I found out that there is another colleague within the same department also sharing the same birthday with us. 3 persons within the same office celebrating birthday together, not bad right. Birthday post 2006 and 2005. World Peace and A Culture of Peace! 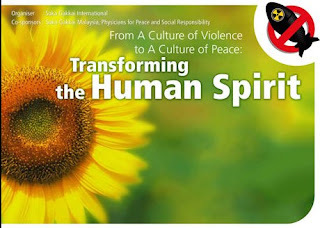 There is an ongoing exhibition entitled: "From a Culture of Violence to a Culture of Peace: Transforming the Human Spirit" currently being held from 1st to 16th September at Wisma Kebudayaan SGM, 243, Jalan Bukit Bintang, Kuala Lumpur. Tel: 03-2141 2003. For more information, logon to the website. It has been quite some time I did not update this personal blog. Most of my time are spent on the other blog - My E-commerce. Its already the end of week 13 of the May semester. Tomorrow will attend the Convocation Ceremony of my students. I have lost count of how many times I have attended convocations since my last personal's convo in year 2000. Next week will be a great week to challenge - Merdeka Day performance is at its peak. Watch out for Gymrama's performance on the 31st August night, live from Stadium Merdeka. That's what I'm been busy for the past 2 months. Of course, I'm am not the one who is performing on the field. I'm part of the working committee team. There is a blog on the whole project - Project 50 SGM, where photographs of the practices were posted. Its a really good blog to describe the project in a pictorial format as well as in editorial formats, from beginning to its latest updates. 1st ever Inter-department badminton competition was held on Saturday among colleagues. It was a fun day and time during the badminton competition. There were 3 teams competing in the competition namely Accounting Department, Management Department and All Starts Team (consisted of Finance, Marketing, English and Faculty office). The format of the competition was each team will play each other in the round robin format before the top two meeting again in the final. There were 5 pairs of doubles game namely 2 mens doubles, 2 women doubles and 1 mixed doubles. Group matches results were Management beat both Accounting and All Stars, while Accounting won their matches with All Stars. Thus the two team of Management and Accounting met in the final. In the final, Accounting department team won by 4-1 against the Management team. I'm played for Accounting as the 2nd pair of mens doubles. During the group match against Management, our pair lost but we managed to beat the All Star players. In the final, we managed to revenge our earlier defeat by beating the Management players with straight sets. 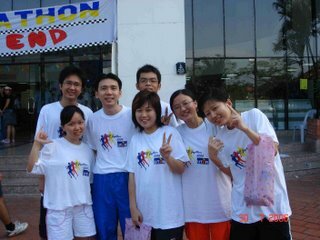 Although it was a tired day, but it was fun to have lots of colleagues participated in this event. Kudos to the organising committee for all the hard works. Another round of light training was held in the morning at the competition venue, Dewan Utama, USM Kampus Kejuruteraan as for the players to get themselves acclimatised to the competition venue. Light training at the Dewan Utama, USM Kampus Kejuruteraan. The first match involved UTAR team was the Men’s Group D match against Universiti Tun Hussein Onn Malaysia (UTHM) which UTAR won by 5-0. 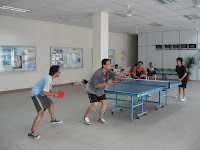 The format of the competition is two singles games, followed by a doubles game and ended with another two singles games. All our players won their matches. 1st singles (left) and 2nd singles (right) matches against UTHM. Doubles (left) and 3rd singles (right) matches against UTHM. 4th singles match in progress. In the same group, Universiti Kebangsaan Malaysia (UKM) received a walkover from Universiti Malaysia Terengganu (UMT), which did not turn up for the competition. Both UKM and UTAR are heading the group with a win each. The ladies team was having a rest day as their matches were scheduled on the second day of the competition. The team managed to have a light workout at the Sport Complex in the morning for almost 3 hours as the actual competition will only starts the next day. It was a small venue as there were only three tables available in a small room with a few teams sharing the facilities. The setting for the main venue will only be done in the evening. At first, there was only a team practising at that moment. We managed to get a table for the team to practice. 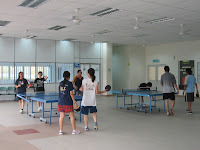 Later, players from other universities such as UTM and UM also joined in the practice in this humid small room. However the practice was abruply brought to an end when the campus was experiencing electricity blackout, which lasted for more than 9 hours, starting from 12.30pm until 9.30pm. Under such circumstances, everyone was still able to maintain spirit as we gathered at the hostel’s cafeteria for our meals. Posing for the romantic torch-light dinner. A romantic group candle-light (torch-light) meal was experienced during the dinner as the electricity failed to be restored by then. Players from other universities were seen leaving the campus by their own university buses to destinations unknown to us before we realised that we were the only group of people left behind in the dark campus. The team continued with their team talks and discussion for the next game tomorrow. Once the electricity was restored, everyone went back to their respective rooms to have an early rest. Elsewhere in Wembley Stadium on the same night, Manchester United was defeated by Chelsea 0-1 in the FA Cup Final 2007 by a late Drogba's goal after Giggs goal was disallowed. Anyway, I'm neither Chelsea nor MU supporter. So this result wasn't excite me at all. The team departed from Pudu Raya to Nibong Tebal on the 18th May (Friday) afternoon by public transportation. It stopped at the Jalan Duta Station to pick a few more passengers before hitting the North South highway. 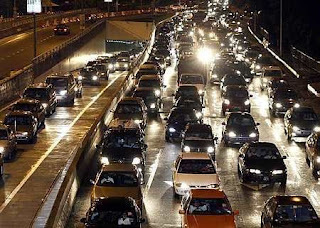 The journey took about four and a half hours (4 ½ hours). Although it was a long journey, everyone was in high spirit and excitement as they were looking forward to represent UTAR for the first time in such competition. The bus driver treated us with a comedy movie first - Mr Bean, before showing a horror movie - Jangan Pandang Belakang. It was already dark when we reached Parit Buntar Bus Station. We decided to fill up our stomachs first. After our dinner, we took three taxis to USM Engineering Campus which is situated about 15 minutes drive from the town. Upon arriving at the campus, we checked-in immediately and had an early rest. I spent another 30 minutes cleaning up my room as it was a bit dusty before hitting my bed. 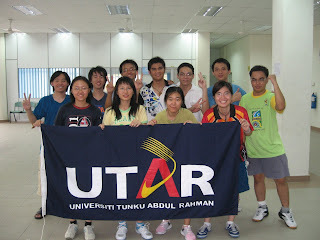 As mentioned in one of the post earlier, UTAR table tennis men's team emerged as the Gold Medalist and ladies' team won the 4th placing during the recent MASUM (Inter-Varsity Games) 2007. Here are the detailed stories part-by-part on the preparation and experiences encountered during the MASUM 2007. We started with the pre-competition first before moving on the actual competition, highlighting each groups matches, quarterfinals, semifinals, 3rd & 4th placing (ladies) and final (mens). The 1st part relates the pre-competition. 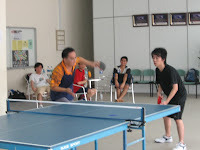 Table Tennis Competitions were organised at each faculty, FAM (Sg. Long), FAS & FICT (PJ) and FES (Setapak), prior to the MASUM to unearth talented players during the months of February to April. 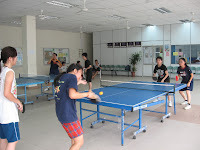 Players from each faculty who performed well during the Faculty’s table tennis competition were then being invited to participate in the centralised selection process, which was conducted at the Petaling Jaya Campus. A total of 12 players were selected comprises of 7 men’s and 5 ladies. Centralised Training (Setapak Campus) 15th - 17th May 2007. A 3-days centralised training was held at the Setapak campus prior to the departure for the MASUM from 15th May to 17th May 2007. Raring to go for the competition! Part 2 - The Journey to Nibong Tebal, Pulau Pinang. Bianca Ryan - a professional 11 years old. Introducing the winner of America's Got Talent 2006 - Bianca Ryan. Fantastics voice and professional performance for a 11 years old. Watched this movie at the comfortable GSC Cineplex at the 1U new wing. It was a nice and entertaining movie with lots of comical and exciting story line. Jack Sparrow with his insanity and funny expressions, the little monkey and the parrot, Chow Yun Fatt's plus other pirates chief antics during their 'round table' discussion were enough to convince me that I have no regret selecting this movie. Worth of watching it. For those who haven't watch it, give it a try and you will start loving Jack Sparrow, William Turner and Captain Swan. 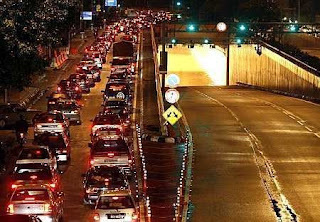 Can you imagine that KL was so jammed on Sunday night? And it was 11.00pm. Of course, this was true as I was stuck in the jam after a heavy downpour around 8-9pm. The notorious flash flood hit a few places but I got stuck at the infamous Jalan Tun Razak. there was flood in front of the Maxwell school. Well, students coming back from their holiday will be greeted with surprise visitors - MUD. Then the underneath tunnel before the SMART tunnel was closed - I guess it was flooded too causing a long line of cars up to National Library, may be. The is a report of flash flood in KL in today's TheStar. Surprisingly, after entering the SMART tunnel, it was a smooth drive all the way to Bandar Sg. Long. By the way, I have been using SMART tunnel for 8 times since it started it one-month free trial. Coming Friday 15th June, a RM2 toll will charged for the motorists, very much lower than what has being anticipated earlier. How's the new template and layout? No intention to change but somehow just want to upgrade the blog to the newer version. So, I decided to change the template and reorganised it a little bit. I will put up more post in this blog soon. In the mean time, you can visit my E-Commerce blog. Thanks to rojaks that I got to know about Beat Box - is the art of vocal percussion using one's mouth, lips, tongue, voice and more to create drum beats, rhythm and musical sounds. Need examples? Here are a few video clips from YouTube.com. This is from French Idol - Joseph BeatBox. This is from Australian Idol. This one beat box with Flute. Anyone can do this here in Malaysia? Yes! Today I donated 450ml again at the Bandar Sg Long campus during the blood donation campaign. This is my 6th time. I wrote an entry during the 5th time donation previously. Duration taken for the donation was short and everything was completed very fast. After the donation, went to cafeteria to have a tea break. Well, I did trying to encourage my students to go for this campaign. At the end of my class today, I asked my students whether they are interested to have a cup of milo later. Some did ask whether its on me. Of course I replied yes. Just go down to ground floor, follow the 7 steps listed and upon completion of the 7th step, then a cup of hot milo will be served! That's the blood donation campaign. New Semester - May 2007 & Ping Pong Champ! 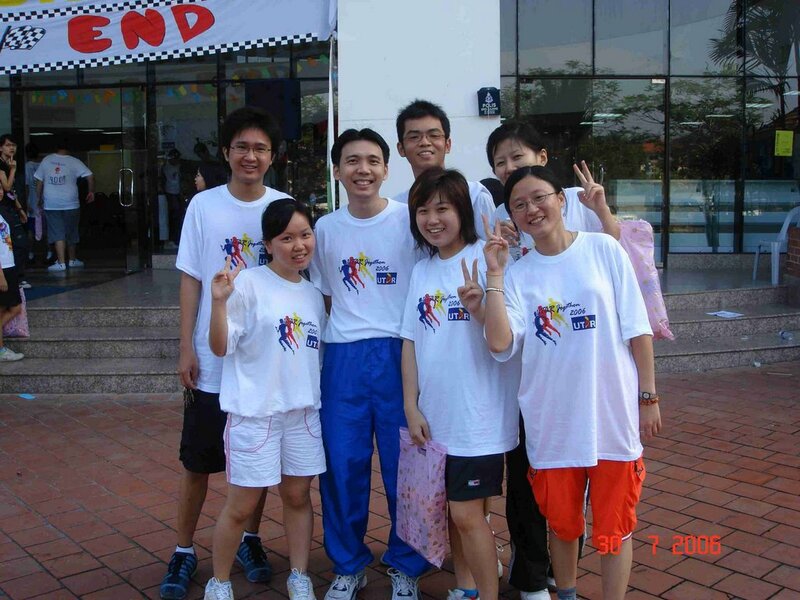 Today is the beginning of a new semester - May 2007. This semester I will be lecturing E-Commerce as well as tutoring Managing Information in Financial Services (new subject for me). Looking forward for all these classes especially the 1st lecture and tutorial session. Last semester was enjoyable because I had 3 subjects - E-Commerce (Year 3) , Managing Information Systems (Year 2) and Information Systems (Year 1). Managed to meet up with a bunch of nice and happy students. I was away for almost a week from 18th May to 23rd May to accompany a group of students to the Intervarsity Games (MASUM) in USM, Engineering Campus. I will write more on this topic on the other entry but just a quick note - our Ping Pong's Mens managed to win the GOLD Medal and our Ladies team was fantastic to clinched 4th place. Bravo and Congrats to them! There will a blood donation campaign from today (Monday 28th to Thursday 31st May). Thinking of going to donate my blood for the 6th time. My 5th time was during November. Come , lets us go together to help those in need! Although it is a bit late to wish all of you Happy New Year 2007, guess better late than never. It has been quite some time I didn't blog here. Well, I can give all sort of excuses but save it for this time. Things are getting more challenging now at work and study! Happy blogging for everyone! Yesterday I donated 450ml of blood at my campus - one of the blood donation campaign run by the students. It has become an on-going event with 3 rounds in a year. Since moving to Sg Long campus, I started to donate my blood - well you will think that you are doing a noble cause. Yesterday donation was the 5th time so far. 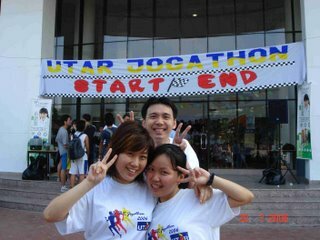 I also have a few colleagues conating for the 1st time this round namely Aik, Ruth and Yew (after many years). Of course a lot of the lecturers supported this blood donation campaign. After 'selling' our blood, we managed to get a lot of goodies in return, hehehe. The goodies seems like getting more and more each round, which may motivate the donors to look forward for the next round. Looking at the tireless efforts by most of the students, its really encouraging. I have one particular student, Heng Yeh Shiuan (Year 2 Sem 2 - BA), who performed her duty, yet at the same time didn't skip her classes (actually my class, I do not know about other class. At the same time, I also do not know her mid-term result yet, haha). At least setting a good example for others who may use these kind of events as an excuses to skip classes sometimes. Looking forward for next round next year! A fast glance on this stat show our Malaysian universities are improving on their ranking except UM which is continuing its decline and also losing its premier title to UKM. Significantly UKM jumped 104 places and both USM & UPM jumped to top 300. What's wrong with UM? Hopefully, more and more local universities can ranked higher in this world ranking. 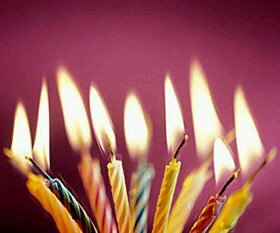 Today is the 1st anniversary of this personal blog which I started last year. Today is also my birthday. Received numerous sms wishes plus phone calls too. Thanks everyone for your thoughts and wishes. be more YOUTHFUL each moment. Life is full with missions! Be the true victor in life! It was the 1st entry of this blog, a poem created last year. Creating a glorious life each day! Have a nice day for everyone. World ranking No 1 university - Harvard University. What makes it so successful? As our local unversities are aiming to develop itself toward world class uiversities, the success story from Harvard University may spring some inspiration for these local unibversities. Harvard Business School don Prof Daniel Quinn Mills said that Harvard is a major university because of the quality of its faculty. The university’s decentralisation policy meant that its president had control of only 7% of the university’s budget. Every school manages its own budget and its own path, subject only to supervision from the president and Harvard’s seven-member board of trustees. Every school must finance itself. In the short term, decentralisation creates big differences in salaries, facilities, etcetra, between the schools. Decentralisation has also allowed Harvard to use varying methods when appointing staff. The Arts and Social Science School hires faculty through ad-hoc committees with no special consideration being given to existing staff but the Business School has a policy of promoting from within. After the race was over. Two of the most mischievous students I had in Grp 1 (BA). I ran and 'walked' 4.5km for almost 30 minutes. The air was fresh and less vehicles around. Was able to have lots of fun on that day. Attended the event as the co-advisor of the Sports Club, which organised the event. These photos were taken with the mischievous students from BA Group 1. Exercise is good for health. Live a healthy lifestyle. The ultimate purpose of education is the formation of the individual human being, not only by sharpening and improving his intellectual potentials and providing him with a rich store of information, but also by inculcating in him ethical and moral standards. Daisaku Ikeda (1992) Search For A New Humanity: A Dialogue Between Josef Derbolav and Daisaku Ikeda. Out of sudden, I received a call from my student this morning to wish me "Happy Teacher's Day". Quite touched by this wishes. Well, at least we are remembered for our contributions....or because I'm too strict and sarcastic in the class......hahahaha. One of my housemate is celebrating her birthday today too! I'm particularly interested on the 3rd point with regards to the knowledge. What is the true purpose of acquire knowledge? To contribute the knowledge learned back to the society, in order to enable more people to attain happiness. However, from my personal experiences, I discovered that some learned PhDs holders or people with high level of knowledge, would sometimes uses unethical methods displaying bad characters in view of protecting one's interest, especially those with positions. In other word, it means to harm others based on the knowledge learned, make others to suffer just to ensure one's position is survived. Then, what is the purpose of acquiring knowledge when it turn out to be harmful. Thus, knowledge without characters is definitely something that we may have to take note and transform it into knowledge with great and noble character. The role of the educators is to help the students to discover their inner potentials and at the same time utilising their knowledge in making this world a better place to live with improved ways of living. If one's hope to be a respectful person, first he/she must respect others and at the same time posessing noble character. The recently announced 9MP (9th Malaysian Plan) indicated that by 2010, 60% of academic staff in the public universities should have PhDs. In another report, the Wan Zahid Higher Education Report, which was made public yesterday, suggested to achieve 100,000 PhDs in 15 years from now. In line with these interesting reports, it is equally interesting to find a thorough writeup on a blog on how to increase the % of PhDs. Among other issues discussed was how the public universities can boost the number of PhDs academic staff. Send potential PhD candidates to countries where the cost of obtaining a PhD is much lower. (Instead of US, UK or Australia, alternatives such as China, India and Singapore should be considered). Streamline the application process such that potential candidates who have been 'confirmed' are forced to apply. 'Let go' of lecturers who obviously don't have the aptitude or desire to do and finish a PhD. A lot of interesting comments was posted in the blog as per this discussion. At last, it's the end of another teaching semester. Having a week break now before going for another grueling week of marking the exam scripts. What I had achieved this semester? 1. My Friendster is growing now. 2. My ubai3013 blog is growing too. 3. Higher satisfaction in my teaching this semester. Feel much relieve after the MSORSM conference was concluded last week. No more pressure and now is the time to catch up with my works and studies. This morning I went for a full tank petrol pumping for my 5 years old Iswara and I broke the record for being the highest price that I need to pay - RM80.00 for 42+ liter of petrol - it was the 1st time I pump petrol after the price increased last Monday. Normally it cost only RM60 to RM65 for a full tank of petrol. What a big difference this time....May consider buying a mountain bike and cycle to work next time, putting on the backpack, wearing sunglasses and cap. Any idea on how to change our life styles to cope with the inflation? This photo was taken on one of the day during the week just post-CNY 2006 holidays. Wearing yellow to prove my colleague's theory. Read the blog entry a few rung below. I got the shirt from the Taiwan Soka Gakkai Youth Cultural Festival in May 2000. CNY 2006 already a history. Half of the January semester already completed. Assignments are pouring in for marking. This are some stories related to the post CNY. Since Monday this week, the university is embarking on a security campaign where all the students and staff need to wear their ID the moment they step into the campus. This is to prevent unauthorised people from entering the premises. I believe this exercise should be put into action very long time ago. How to encourage everyone to war the ID card? I'm wearing it because I have inserted the magnetic access card for staff room in the ID card holder together with my ID card - I need to use the acess card to enter into my office. Do you have anymore ideas? Or may be you can share with me whether you prefer to wear ID card or not. Red or Yellow for CNY? 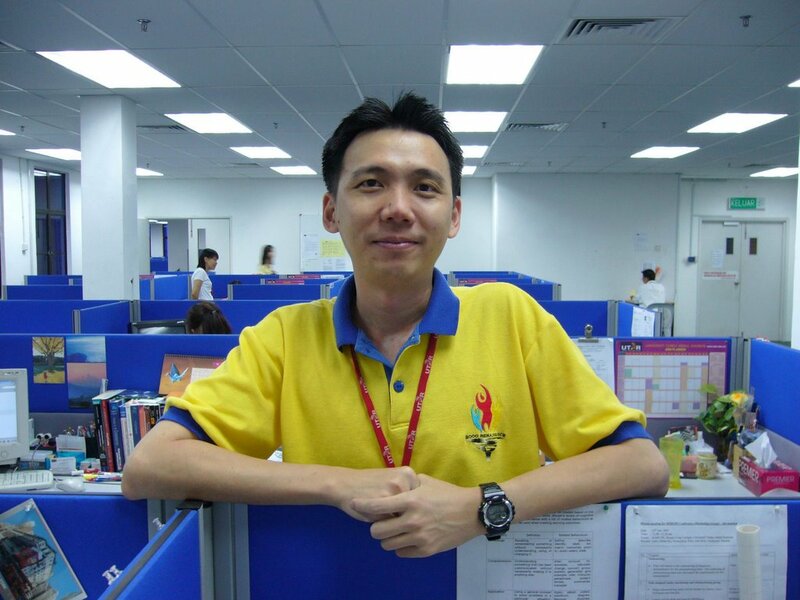 Fancy wearing Red colour shirt during CNY? Some believe it will bring luck especially during the "investment games" session. I wore it twice and seems like my investments did not perform, it even went below the par and can't get it to break-even. A colleague of mine suggested a striking yellow may change the Bear into the Bull in the "investment games". Fancy to give it a try? No matter what, be careful as not to get the much publisized limelights such as getting bald for playing mahjong. I just wonder how long is the uncles' hair that the police need to 'potong pendek-pendek' their hair? Some even look more good looking with the bald head. Come this Sunday - its Red (Liverpool) or Blue (Chelsea). 1st time since I started working, I took an additional day off before CNY holidays for a short family vacation. Every year, the normal routine will be spring cleaning, rest, watching TV, reunion dinner and preparing for CNY. This year, the rhythm changed a bit where all these took the back seat as my family went for a short vacation near the seaside. Managed to beat the heavy traffic on Friday noon as well as Sunday noon where the opposite direction of the highway was a long line slow moving cars...imagine being stucked in the jam for hours on the 1st day of the CNY under the immense heat of the sun. Furthermore, my car's aircon was giving me some problems throughout the journey. Quite lucky then, I guess. I decided not to bring along my laptop as it is a good time to rest and destress, although I had just downloaded a HK drama-series "Life Made Simple" (New Ah Wong) into my hard disk, which I really wish to finish watching it as soon as possible during the CNY holiday (which I did managed in the end). I ended up almost becoming like "Ah Wong" chasing after my two ever-energetic little nephews. Food, sleep, enjoying the sound of the waves and driving - main activities of the vacation. I recalled that I have a former colleague who used to travel to have a few days stay in a hotel near the seaside whenever he want to write some chapters of his book. Not a bad idea. I may want to give it a try some time in the future. Back to KL and my CNY begin....half a day later compared to the previous years. Happy Birthday to everyone as today is the 7th Day of the CNY - Everyone's Birthday! Back to school & work...post CNY. Work resumed on Thursday (2/2/06) with morning class at 8am. Still being fresh from the Liverpool-Birmingham City match, a smooth drive from home to office kicked start the day. The office is very quiet throughout the day - both yesterday and today. Car park is empty. Nearby shops are not fully opened. I guess everyone is still enjoying their CNY celebration. All these will be transformed by Monday when majority of the students are back from their holiday, minus those who extended theirs, especially from Sabah & Sarawak. Then, assignments deadline are approaching. Another round of madness, hahaha. Wishing all of you "Gong Hei Fatt Choy" with good health and prosperity. Most of the time we always find that 24 hours in a day seems not enough for us to accomplish astonishing amount of tasks and works , be it at the workplace or being personal. Whether time can be bought? Any comment? Yours are definitely be welcomed to share with us. Jackets are common as the temperature at the examination hall may occasionally reaching 15C to 20C. Should there be any basic rule and regulations on the attire while sitting for examination? Any comments? How to be a Professor? A lecturer has to apply for the post of associate professor or professor. He has to list all his academic and professional qualifications as well as his achievements in teaching, research, consultancy and administration. His application will go through several stages of internal and external screenings. The final hurdle is a gruelling interview by a panel made up of internal and external members to review his qualifications, excellence and comments from external reviewers and assessors. This practice may vary from one university to the next. Are we on the threshold of a new age? The scientific upheavals of teh 20th century have brought about a thrid industrial revolution: The new technologies that are essentially intellectual technologies. This revolution, which has been accompanied by a further advance of globalisation, has laid down the basis of a knowledge economy, placing knowledge at the heart of human activity, development and social change. Does 21st century will se the development of societies of shared knowledge? There should be no excluded individuals in learning societies - for knowledge is a public asset that should be accessible to all. The digital divide - The number of Internet users is close to 1 bilion, yet 2 billion of people are not connect to an electricity grid and three-quarters of the global population have little or no access to basic communication facilities. The cognitive divide - even deeper and much older, constitutes a major rift between North and South, as it does within every society. The concentration of knowledge - particularly high-tech knowledge, as well as large-scale scientific and educational investment, on restricted geographical areas, reinforcing the brain drain from South to North as well as North-North and South-South directions. Knowledge exists to be shared - but once it is converted into information, it has a price. How is the necessary balance to be struck betwen the universality of knowledge, implying accessiblility to all and respect for intellectual property rights? The development of societies of shared knwledge is today hampered by deepening social, national, urban, family, education and cultural divides affecting many countries and by the persistent gender divide reflected in the fact that 29% of girls on the planet do not attend school and that women are under-represented in the societies. To overcome these obstacles, the nations of the world will have to invest massively in education, research, info-development and the promotion of learning societies. Invest more in quality education for all to ensure equal oportunity. Government, the private sector and social partners should explore the possibility of introducing progressively, over the 21st century, a "study-time entitlement" giving individuals the right to a number of years of education after the completion of compulsory schooling. In this way, everybody would have access to lifelong training and would be given a second chance in the case of having left school early. While increasing investment in scientific research and in quality research geared to future challenges, there is also a need to promote practicl and innovative approaches to sharing of knowledge, such as the colaboratory. The new virtual institution, telescoping laboratory and collaboration in one word, enables researchers to work together in cross-frontier scientific networks. The need to promote linguitic diversity in the new knowledge societies and turn to account local and traditional knowledge. For the first time, Malaysian public universities will be opened to foreigners, with 5% of undergraduate places in critical courses being allocated to them. Higher Education Minister Datuk Seri Dr Shafie Mohd Salleh described the move as a social obligation to nations with which Malaysia had exploration rights, especially for petroleum. Dr Shafie said the ministry was also looking into rating universities based on disciplines and not under a general ranking as published by Britain's The Times Higher Education Supplement. “When the faculties are highly-rated because they have good lecturers and researchers, then students are more likely to enrol there, resulting in better quality teaching and research,” he said. Dr Shafie added that the ministry was currently coming up with a paper on the proposal. He added that the Government's goal for 70% of lecturers in universities have PhDs by 2010, against the current 29.7%, was a tall order. As a short-term measure, the Government would be beefing up the number of academics by hiring more foreign lecturers with PhDs. Imagine having angpow, latest technological gadget, a trip to Hong Kong and more to come....for being the top student in the UPSR examination for a 12 years old student. This is what being reported in the newspaper today. I vividly remember when I was a 12 years old boy, no angpow or any latest tech gadget when I finished top 5 in my class. During the primary school, what I still cherish is the memory of getting a small Lego set from my mum each time (for a few years) as a motivation or reward for being top in my studies. When it comes to SRP (older version of PMR), a small bookmark from a senior is my most precious memorabilia. No big party, no big present for someone who scored A1 in all the subjects, eventually being the top student in the school, may be the top in the state or may even in the country.....hahahaha. Time is changing now.....! Should we shower our children with such expensive gifts as rewards for their great examination achievement? Are we teaching our children with the conditional love (if they perform well, they will be rewarded with great rewards)? May be in the future there will be more stories about how high achievers will be rewarded with more extraordinary kind of rewards. Eventually the rewarding system will keep on evolving. Are you doing the right thing, Mr Academician? This is an reply from a fellow colleague on the topic that I had posted earlier at: What is the real work of a university academician? While I agree that these are some of the tasks that an acdemic perform, I feel that it is more important to emphasise the function of an academic. In a nutshell it is to remain relevant and useful to the industry AND society. We supervise research, but we merely quantify with SPSS what has happened historically when we should be developing concepts that help us manage in a chaotic world. We write books for the sake of publication, but never measure it with the acceptance by industry. We organise academic conference for academics so that we all can pay the conference fees and present our papers, never mind that nobody in the industry will want to pay the low fees to come and hear us speak. The tasks that we list out will grow longer and academics will do more but produce less, as academic bureaucrats wrestle with "controlling" the situation by making us work towards all the wrong Key Performance Indices. Carrying out the tasks of the academic is futile unless the work and graduates that we produce are relevant to the industry. We may have to stop and re-examine our role in the industry/society and country. Are we doing things right when the Human Resource Ministry have to retrain our graduates, where no one believes in our SRP/SPM straight As students, and where HR managers sneer at our high percentage of 1st class and 2nd Upper Honours students who behave like diploma holders. What do we say in reply to all the opinions that the public lay before us. Is it true that we are in an ivory tower still in blissful denial? Or should we become an academic like Peter Drucker, Kaplan and Norton where the industry look towards for guidance in a highly competitive world. Any prizes for guessing why 90% of the top universities in the world are found in USA and Europe? Our real work starts when we come out of our state of denial and re-connect ourselves back to the industry. Leave research work and concentrate on teaching? An opinion posted by a concerned parent on TheStar, 12th November 2005. AS a parent I am rather confused by the letter “Distracted from their real work”, (The Star, Nov 10). The writer seems to suggest that university teaching staff should be promoted based on their research and publications. Isn't that a conflict of interest here? How do teaching institutions ensure that staff actually teach with enthusiasm and dedication, and not in a perfunctory manner for the required time and then leave to concentrate on their own research? After all what incentive is there to teach if your promotions are based on your research? Furthermore if teaching staff have enough time on their hands to carry out research, why then do we have 60,000 unemployed graduates, who are apparently so poorly trained that they have to be retrained? Why was the time spent on research not used to teach weaker students? After all is it not the duty of the teacher to make sure that every student who walks out with a degree is well trained and competent? We can always leave research to career researchers and scientific staff. If the lecturer concentrating on the teaching alone, we are just imparting the 'done' work or "textbook" subject content to the students. Research helps to links the theories with the applications especially in the real society or business environment. For social, scientific or business- related researchs, lecturers and students play a major role in discovering new ideas and knowledge - after all university is a powerhouse of knowledge - where new knowledge should be generated and shared. I would say the lecturers should strive a balance in term of teaching and research. Teaching without doing a research is just like transfering the textbook syllabus to the students. Research without the teaching will limit the sharing and development of the new knowledge. I strongly believe that it is the VALUE CREATION that each and every lecturer should possess and undertake to assist the students to manifest their potentials and to help the university to become the powerhouse of knowledge, which will drive the development of the society and the nation. What is the real work of an university academician? Being an academician, I would like to give my opinion on why the majority of Malaysian universities are not in the ranking list of the world’s top universities. The fall of Universiti Malaya and Universiti Sains Malaysia in the ranking list, with the exception of Universiti Kebangsaan Malaysia (UKM), of the Times Higher Education Supplement is not really a shock to me. In fact, I feel it is quite questionable how the three universities were listed in the first place. Most local universities nowadays don't follow the norms of a university. They do not use paper publications and citations as the main criteria of appraisal any more. Each year, we see professors and associate professors being appointed with hardly any good international journal publications to their credit. I don't think citations are considered at all in appraisals in any of the local universities. Other important criteria such as appointments to the editorial board of international journals and programme committees of international conferences weren't considered. The local universities are more interested in participating in exhibitions such as those held in Switzerland, Britain, Germany, Korea and the United States. They are more interested in bringing home the gold, silver and bronze medals given by the organisers, which hardly have any value. Over the last few years, there have been many academicians who were appointed as professors and associate professors just because they obtained gold medals in these exhibitions. How could the two or three judges who are not experts in their respective fields and who evaluate research work have so much influence on our local universities' appraisals? A paper submitted to a high-level international journal would normally take weeks and months to be reviewed by experts and professors from the same discipline from well-established universities. The paper would then need to be revised before being published, if it does not get rejected. However, there is a high possibility that the paper might be rejected. Compare this difficulty of getting published in high-level journals to that of getting a gold medal at these trade exhibitions. And yet we see vice-chancellors publicly rewarding the gold medallists from these exhibitions each year. One way to measure whether a research has made any breakthrough is to do a survey of the hundreds of university researches which won gold medals over the last few years. How many of these researches have actually been commercialised and brought revenue to the universities? I think the Higher Education Ministry and the Science, Technology and Innovation Ministry should stop local universities from participating in these exhibitions. Academicians should be doing high-level academic work and not participating in trade fairs. I want to ask whether Harvard, the Massachusetts Institute of Technology, Cambridge, Oxford or even our neighbours, the National University of Singapore and Nanyang Technological University, ever participated in these exhibitions at all to be ranked as the top universities in the world? An E-Commerce lecturer and amateur blogger.